Suffolk Naturalist: The young and the old. Hello dear followers and a warm and happy welcome to two new followers Rob and Ryan, welcome aboard and glad to have you as my followers. Well I'm pretty sure by now, wherever you are in the country, you must have definitely felt the effects of autumns approach. In fact I woke up this morning to get to the moth trap before the birds and the first thing I noticed that the heating was on. Noticed it even more when I stepped outside, half awake to a very chilly 9.2ºC. Brrr. Even the moth numbers were down compared to last weeks 274 moths of 46 species. This mornings trap only yielded 121 moths of 23 species and 1 little caterpillar I found crawling across the floor towards the trap, which I identified as a Bright-line Brown-eye moth. But not to fear, even though everything is beginning to tuck itself up for winter, the last of my Hawkmoth's included, there's still plenty to see and do. Privet Hawkmoth on the left at 2" long. The rest are Poplar Hawkmoths. No, I'm not going to university (unfortunately), it was for an event being held by the Amateur Entomologist Society (AES) and their Bug Club for young aspiring entomologists. Not that I'm a young aspiring entomologist, more of an old aspiring entomologist. But I was welcomed along all the same, including non-members to see what it was all about. The Oxford University Museum of Natural History has been closed all this year whilst they have a bit of a refurbishment, yet we were welcomed in, behind closed doors to see behind the scenes in the entomology department. This is akin to music from the heavens for any entomologist, amateur or professional and I was going to pass that one up and it seemed that it was meant to be for me to attend as wifey found a glass art course happening on that day only a couple of minutes away from the museum, bonus! It didn't start until 11am and the first thing we did was all tramp off to the local park where the two staff on hand Darren Mann and Chris Jarvis explained and gave a demonstration to all the gathered kids on how to use a sweep net to collect specimens. 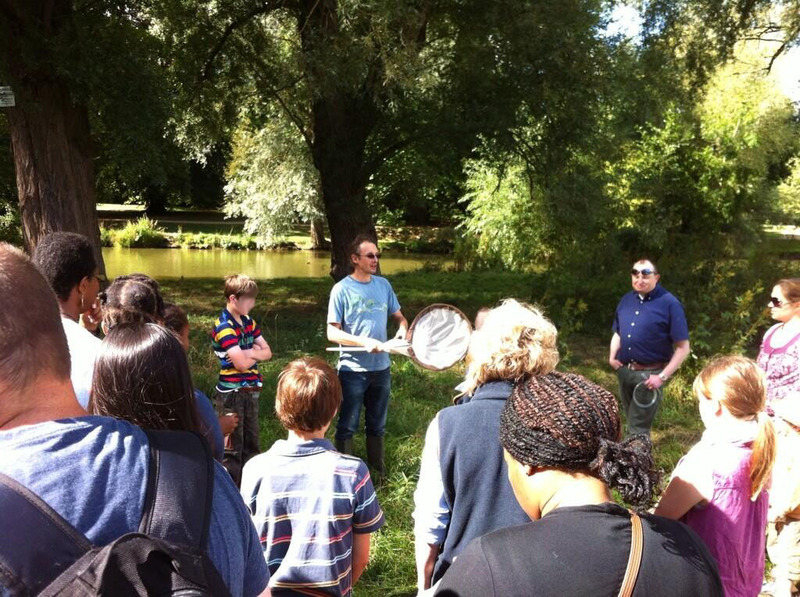 Darren gives a talk and demonstration on how to use a sweep net. With a few sweeps, Darren showed just how many specimens he could bag and before you knew it, there were kids everywhere sweeping the local vegetation looking for whatever they could find. It was during this time I bumped into Hermione, a BSc Environmental Science graduate about to start her MSc. Whilst we were chatting I happened to look down to my side and immediately saw a large pair of wings sticking out from behind a leaf by my knee. I knew straight away what this was and like any good, prepared naturalist whipped out a small glass vial from my pocket and placed it, very slowly over the subject. Yes! It was a Hornet mimic hoverfly Volucella inanis. Neatly caught within my glass vial. As you can see from the picture above, it's quite a large hoverfly, in fact it is the largest hoverfly and I'm sure you would agree, it looks very much hornet like too. A good defence strategy if I ever saw one. These do not sting or bite, but only drink the nectar from flowers. Their young larvae live in the bottom of wasp and hornet nests feeding on the detritus they find there. The same hoverfly happy to pose for a pic after being released. 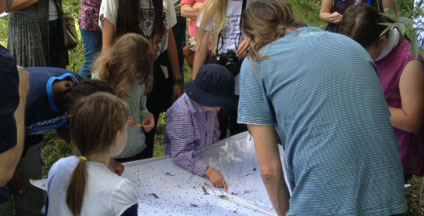 The kids were then shown other ways of collecting and looking for insects, including looking on and under the bark of trees as well as beating and the use of beat trays. Inspecting a beating tray after giving a branch a good shake. After about an hour of this we all headed back to the museum for a spot of lunch. This is where I caught up with Sally-Ann Spence of Minibeast Mayhem, the educational outreach roadshow that teaches children lots about bugs using giant insects such as large stick insects, cockroaches and praying mantis'. I've only ever had the pleasure of communicating with Sally-Ann through the medium of Twitter before now and she has always been so helpful with advice and encouragement before and none of that changed when I met her in person. In fact she exudes enthusiasm and encouragement which is really nice to see in a person. She is also very passionate in getting these sort of lessons into our educational curriculum. And why not, after all, nearly 80% of all life on Earth is an insect. Kids are fascinated by the natural world and yet we never ever teach our children about it. It's the biggest dis-service we could ever do to our children, thankfully, there are people like Sally-Ann who are out there trying to put an end to that. If you've got a child in school, try and get your school to book Sally-Ann to do a workshop, your child and others will thank you for it. After lunch, the youngsters (and some of the adults too) got round to a spot of pinning. 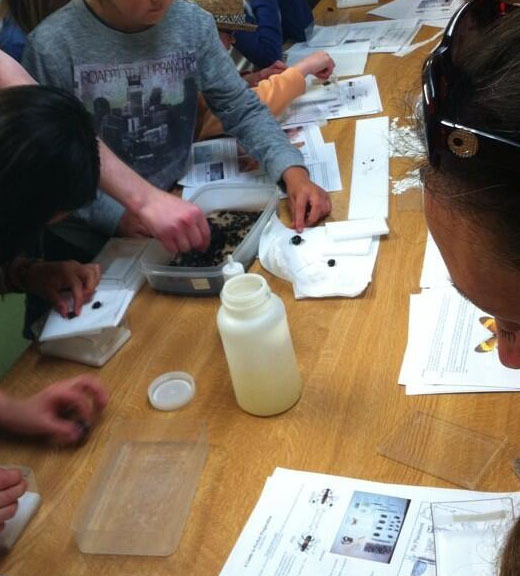 Using beetles preserved in alcohol, the children were all given boxes, foam, pins and instructions and shown how to pin and display an insect. Select your beetle, dry it out and pin it. All the kids took to this with great gusto and not before long they each had a little display box with lines of beetles neatly pinned to take home. You might think that giving kids pins is a recipe for disaster, yet no children were harmed during this well supervised activity. After this we came to the bit I for one had been eagerly waiting for, the behind the scenes tour. This is where we were taken to the various store rooms around the museum to see the thousands of trays holding specimens from all around the world, including the oldest pinned insect on its original pin. A Bath White Butterfly caught in Cambridge in 1702 and still on its original pin. Before insects were pinned, they were usually stuck on a piece of card, a bit like a pressed flower. However, the downside to this is that you cannot examine the ventral surface (the underside) of the insect in question. So that is why insects are usually pinned now instead of being stuck on cards. This is not the only boast the Oxford University Museum of Natural History can boast of. 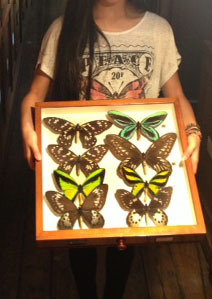 Recently a work experience teenager working here found butterflies collected by the Victorian naturalist Alfred Russel Wallace. Many of his collection was lost at sea when a fire broke out on his ship, yet the teenager Athena Martin searched through over 3000 drawers at the museum and found over 300 butterflies from his collection. Another fine example why we need more youngsters coming into the profession. You can read more about it here. The tour took us up into the attics of the museum above where The Great Debate took place over Darwin's Origin of the Species. Here the cabinets filled the spaces in long rows each containing many display drawers and each cabinet stacked two high. This is just one side of the roof. When we walked into this room, both me and Hermione looked up in amazement and said in unison, "Wow, I could live here." The atmosphere of the room and the smell of mothballs took your breath away in a good way and I could totally spend a long, long time in here just sifting through the drawers. There is quite a range of insects stored here, wasps, flies, butterflies and moths. Not only from the UK, but from all over the world. Some lovely looking wasps all elegantly pinned for display. Some of the largest butterflies in the world. And some of the most iridescent too. Even I was caught in the act. There were bugs of all shapes and sizes. Yes, there were bugs of every shape and size from tiny little things stuck on a card because to place a pin in them would virtually destroy them. Then there were the large beetles from the genus Dynastes. That's my hand in the picture to give you some idea of scale. I would love to see one of these in the wild, they look awesome when they're dead, they must look out of this world when they're alive and walking around. There were beetles of unimaginable colour too. Who would've thought such a colour existed in nature? Another species, another wonderful colour. Sorry for the blurriness, camera phones don't work well in low lighting. Of course, there were so many different specimens too see, that it would be impossible to see them all in one day. Sally-Ann commented that if one person was left to catalogue the whole insect collection, it would take them well over 100 years to do so. That really would be a job for life, I wonder if I can apply!! After the tour, we were all introduced to Sally-Ann's not so little friends. Sally-Ann had brought with her some of her educational insects that we could all get to hold and stare at in awe. One of these included a Papa New Guinea Spiny Stick Insect which Sally-Ann put into my care to look after. Papa New Guinea Spiny Stick Insect on my forearm. Such a beautiful creature and quite a sturdy thing too. 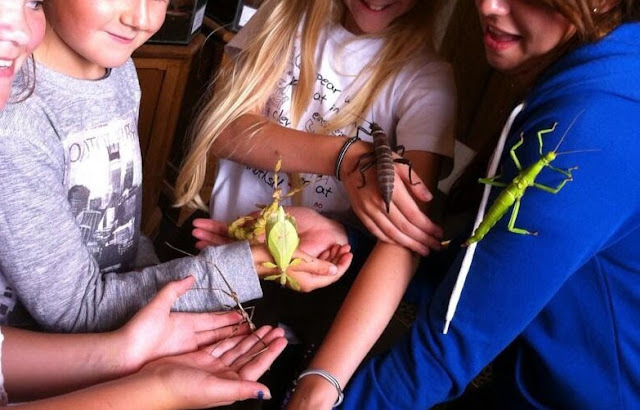 Sally-Ann had showed me how to handle the insect when letting the children hold them and it wasn't long before I had several kids asking me to have a hold. All of the kids were great in letting them walk up their arms. Only one child had doubts and pulled away as soon as it set foot on her. But fair play to her for even trying as she was obviously a little bit scared by it and who can blame them. Insects this size are not seen in the wild in this country and couple this with the fears of the adults, some of who scream at the sight of a bee, then of course some children are going to be scared. They learn fear from us. But with the right education and coercing, it needn't and shouldn't be like that. Then more and more of the insects were shown around which the kids loved. Getting to grips with a variety of insects. Last but not least, the museum have some specimens of their own including this lovely scorpion being held by Jordan Rainey. Am trying to work out what's biggest, Jordan's smile or the scorpion. Needless to say, there was one creature that I spotted from the moment I walked in and when the opportunity came for me to have a hold I couldn't resist. It truly is a thing of beauty and the feeling of it walking up my arm is one I can only explain as strange but enjoyable. What a wonderful way to end a wonderful day is all I can say on that. But before I sign off, there are just a couple of things of utmost importance that I would like to say. 1. Yes, these insects are fab and if you're considering getting one for yourself PLEASE, PLEASE, read up on the insect your interested in first. Make sure you can give it all the right conditions and foods it requires without any problems. Can you afford to look after it? Don't make sacrifices either, make sure it has the proper purpose built equipment needed to house it. IF IN ANY DOUBT, DON'T GET IT. Because in the end, it'll only be the insect that suffers for your error of judgement and that is most unfair. 2. I would like to say a great big thank you to the museum staff Darren Mann and Chris Jarvis for all their expertise on the day and providing such wonderful things to look at. Dafydd Lewis of the Amateur Entomologists Society for organising the event and Sally-Ann Spence of Minibeast Mayhem for all the wonderful creatures, encouragement, enthusiasm. It was a pleasure to meet you all. 3. I would also like to say a special thanks to Sally-Ann and Hermione for letting me use some of their photos taken on the day, I really appreciate it. Thank you. That's all for this time, I hope you enjoyed it as much as I did. Till next time, keep safe.